What is the purpose of your hostel website? To decide what the essential elements are for your hostel website we must go back to the original question - What is your website for? The answer for most people is to turn visitors into guests at your hostel - simple. So now the question becomes - what elements are essential to turn visitors into guests? Most things in life are complicated; fortunately, this is not one of them. Although travellers may be looking for all sorts of specific information the vast majority are only looking for three things! Once they are satisfied with those three things they will then need the fourth essential element, a booking form to make a reservation. The photos of your hostel serve a similar purpose as the style and design of your webpage that we covered in the first instalment of this series - they give the visitor a feel for the personality of your hostel. For this reason photos of your communal areas are essential, if you just have photos of the rooms people will not get a feel for your hostel. Photos are a very quick way to display the facilities that your hostel has but when taking photos you should be far more focused on ambience and personality rather than facilities. Size matters! You want your photos to be as big as possible and if people are viewing your site on a small screen they should expand to be the full width of the screen. More on responsive web design later. You should have photos of every bedroom and common room in your property. Once they have been displayed you can show more specific photos of facilities. Photos of the sleeping quarters should be taken when they are completely empty and photos of the communal areas should be taken when guests are actually using them. Taking photos of your communal areas when they are empty will make them look lifeless. If you run trips from your hostel or the immediate surroundings are a big attraction then include photos of these too. Where you at? The precise location is absolutely fundamental and I would not recommend anything other than an interactive Google map. It is easy to put into any website and provides the perfect solution. Displaying your location is not just to show people where you are in order to convince them to stay with you. It is essential for guests to find your property. This is why a google map is essential because if you just have an average street map and the bus station they arrive at is outside of your map, they will not be able to plan a route from the bus station to your hostel. Go full width! It isn't essential and depends on your overall design but your map is a great element to expand full width to either side of the screen. This way it becomes its own page section and makes it as easy as possible to use. 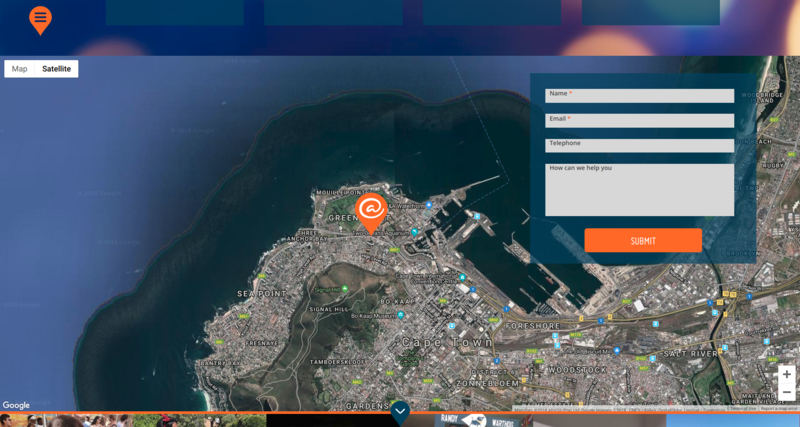 When you install google maps on your website you will have the option to make the map interactive just as Google maps normally is or you can keep it fixed so that people can not zoom in or out. I strongly suggest making the map interactive. This will allow the visitor to zoom out and find their point of entry into your town/city. This doesn't need much explanation. The only thing to avoid here is complex pricing structures. You must avoid things such as "10% more on weekends", the client should never have to calculate a price. You should also avoid complex pricing such as different prices for three periods of the year and then a different rate for weekends. If you do have a complex pricing structure it should put in a very clear tabular form. Do not hide your pricing!!! This works for some businesses, not for hostels. You may not put them on the homepage but they should not be hard to find. Many backpackers are on a very tight budget and will have a maximum amount they will pay for a bed. Hiding your prices will frustrate the visitor and make them more likely to leave your site. There is one key to pricing - Keep it simple! You can have the best hostel website on the planet and convince every single visitor to stay in your hostel but without a booking form, you won't make a single reservation. If you feel you require more information don't forget that you can ask for this later on in the reservation process. Your booking form must be on the front page and above the fold! *Above the Fold refers to the part of the webpage that is visible without scrolling, anything that can only be seen after scrolling down is referred to as below the fold. You should have Book Now buttons placed at different locations throughout your website that link to your booking form. You can place your booking form on its own separate page but this means that another page will have to load to display it. If the booking form is on the homepage the user will be taken to it immediately from any homepage button. If you put a book now button in your header not only will there be a button on every page but if it is a sticky header (meaning that it always stays at the top of the screen) there will always be a book now button in view no matter where the visitor is on your site. Three fields ideally, five maximum. Social media elements almost made the essential list they are so important. The only reason they didn't is that they are not essential to turn a visitor into a guest. Social media elements are essential to promote your hostel and allow users to interact with your hostel. If people are staying at your hostel and they take a photo, create a post or send a tweet they can include your business with a hashtag or link with the power of social media. Travellers often communicate with each other through social media but your business cannot be included in that conversation if it is not on those social sites. The other reason to use social media and probably the most important reason is SEO (Search Engine Optimization). SEO is the science of making your website appear in search engine results. We will go into SEO in detail in the next installment of this series, but for now, let's just say that search engines such as google analyse literally hundreds of factors that determine whether they display your page or not. One of these factors is your presence on social media. The more people talk about your hostel on social media the more likely you are to appear in googles results pages. A video of your hostel is not essential at all. However, video is the most effective form of media in terms of turning visitors into customers. Nothing converts like video. When people come to your site they want to get all of the information they need with the least effort possible. Watching a video is far easier than reading or scrolling through images, therefore, people are likely to engage with it. Video gives you the most powerful way to showcase your hostel and your team. You can do a virtual tour of the hostel including a brief piece to camera or you can simply record a slideshow of different images and information. The video should be above the fold so people can watch it as soon as they land on the site. People are usually going to either watch the video or browse the site. The video serves as a small version of the website itself - a smaller showcase of your hostel. Less is more when it comes to video, no-one is going to watch a five-minute video about your hostel. You want to aim for no more than 2 minutes long. Clink hostels give us a perfect example of a hostel video done right. Its just over one minute long delivers all important information and above all, it focuses on conveying their specific vibe. Frequently asked questions do not need to be on the front page but they can convert visitors who were otherwise on the fence AND save you time and money. Only you will know what your frequently asked questions are as you will be answering them manually. Once you have been asked the same question 10 times - put it on the FAQ's page. Your website must be responsive - period. Responsive web design means that your website will adapt and respond to different devices. The website will change its format and sometimes content depending on the device that is viewing it. In 2018 over 50% of internet usage is mobile and for hostel reservations, this is most likely far higher. Although we don't have official figures for the hostel industry we can look at the travel industry as a whole and extrapolate. Up to 80% of last-minute bookings are made on mobile devices. The vast majority of guests in hostels are backpackers. People who carry everything on their back don't tend to leave home with a desktop or even a full-sized laptop. Almost all of them will use either a tablet or a smartphone. Having a website that is not responsive and does not display well on a mobile device is literally suicide - your website must be responsive! We have now covered the elements that should be in your page but we haven't said anything about where they should be. In this guide, we want to convey as much information as possible but at the same time, we don’t want to create some sort of formula that you can not stray from. Use the following information as a rough guide then tailor it to your personal situation. The above the fold portion of the homepage is the first thing that a visitor will see when landing on your site. First impressions are instantly made and it is from here that the visitor enters your website. For these reasons, this section is easily 80% of your website. As we mentioned before, if you have a video this would ideally be above the fold but not essential. In the first section of this article, we talked about the most important elements in the page. As a general rule the most important that element the higher up it should be, it's that simple. There is no specific order but photos of your rooms, photos of your hostel and a map or address should be front and center. The only exception to this is that the map can actually be put at the very bottom of the page above or below a contact form. If you do this you should put a link to the map near the top of the page so if people click on it the page immediately scrolls to the bottom of the page. Contact forms can be put at the bottom of the page with a link in the header that will jump to it. Each element such as rooms, photos or location should have its own unique section that is visually distinct from the sections above and below it. This can be achieved by a divider or a different background colour. Your website MUST be responsive! What you are, who you are and where. Throw Away Your Hostel Logbook - It's not working.